The Shaper 1300 High Performance series comes in two sizes, five optical choices and multiple lamping options. 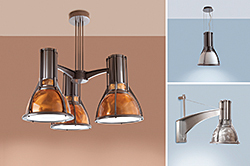 The series can be ceiling, wall or pendant mounted. The fixtures are offered in 13 jewel-toned colors as well as hand-painted faux wood options. Pendant mounted fixtures can be held in place with a rigid stem or four aircraft cables, or can be surface-mounted to a standard junction box.